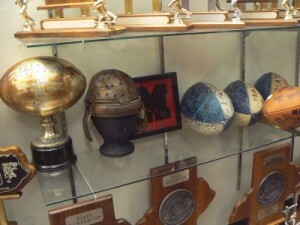 Mayfield is among one of the most athletically dominant schools in the state. Because of its size and ability to produce consistent championship caliber teams, Mayfield High School is held in high regard as being one of the states greatest football schools. The town itself bases its activities around Friday nights in the fall, when War Memorial Stadium roars with the echo of cheering fans and colliding helmets. Mayfield has won 7 state football titles, numerous district and regional football titles, and various other accomplishments in soccer, baseball, volleyball, track and field, and basketball. The effort to support the school and its athletics is a combination of the entire town and businesses that help fund and support the school. If you have any documents or you would like to submit articles you have written please contact us at mhscardinals@gmail.com. We will give full credit for anything submitted to the site! !